One of the most tiresome activities for an investor is how to get a good search engine to find assets. All are limited, because they do not filter what we would like or provide only some figures. Of course, there are full products, but the price is only acceptable for companies or fund managers. Price range: with a minimum and maximum price. Once you screen, you obtain a great deal of figures to analyse the assets. 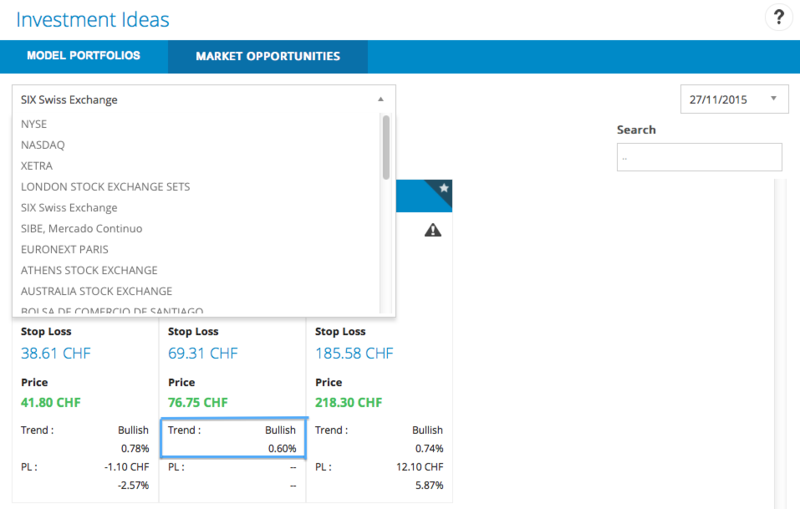 Apart from the common summary, with the closing price, the change and our score, you have separated tabs to watch the performance for different timeframes in a row, figures related to the asset risk (VaR, volatility and maximum drawdown) and trend signals charts. You can rank all categories from the highest and upside down. You can also click on every asset to obtain the T-Report, our in-depth report of every security in our platform. We live in a world full of information, but it is useless, when it has no order or we cannot find what we need. The Screener is the solution for smart investors who bet for a self-directed model: an easy-to-use and quick search engine to find the assets you are looking for. The price: free. Why should investors pay for good relevant information to create their own portfolios? This entry was posted in Discover and tagged asset, Asset class, Asset type, funds, Screener, Stocks on July 6, 2016 by Oscar Garcia. A year ago, T-Advisor faced a great evolution with the 3.0 version. A user-friendly look and feel, new tools and innovations and, above all, the creation of a financial community. These breakthroughs have opened new possibilities and we have answered to them. The exchange of ideas is one of the great demands amongst the users of every financial solution. Nobody wants to feel alone. We prefer to share our knowledge, experiences and ideas. 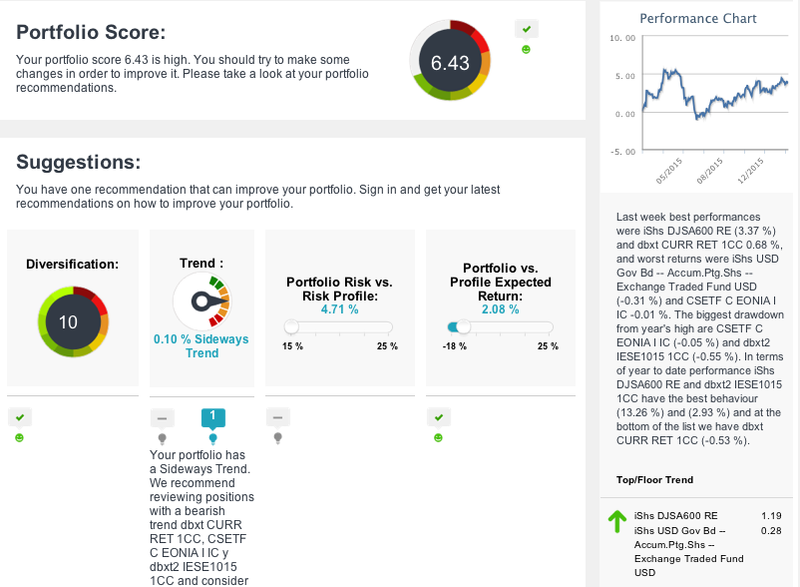 This is the point of our recent evolution in T-Advisor 3.0. We get more social and promote the exchange of recommendations. How? Don’t worry! We keep our T-Report, but we show the assets with a more attractive and easy-to-understand design. You can include the asset in your own portfolios clicking on the portfolio icon or just follow its evolution clicking on the chart icon. In addition, you can recommend buying or selling the asset. All your followers will receive an alert in their notification inbox when you do any bullish or bearish recommendation. 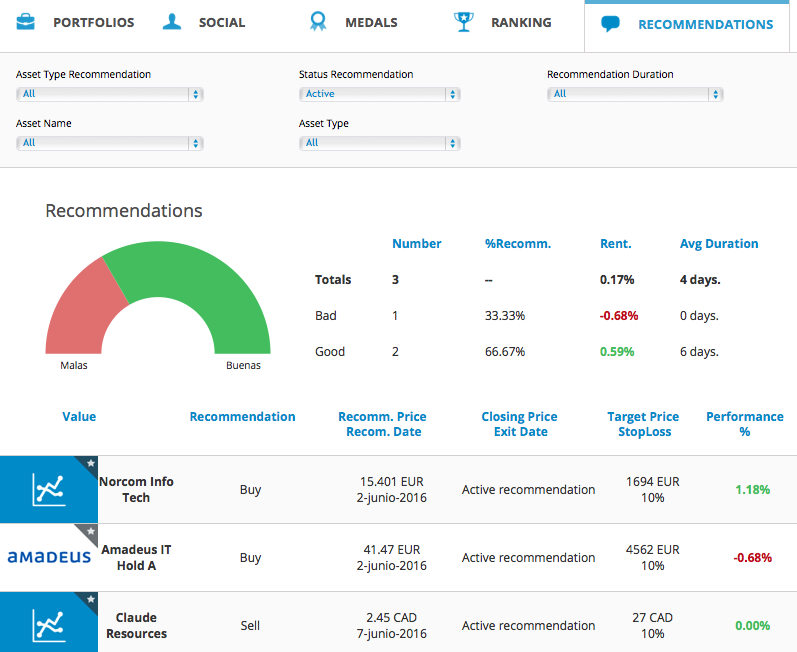 In the lower modules of the asset report, you will also find the user that makes a recommendation. If you click on your user profile, you can watch all your recommendations with statistics and filters to select the information. 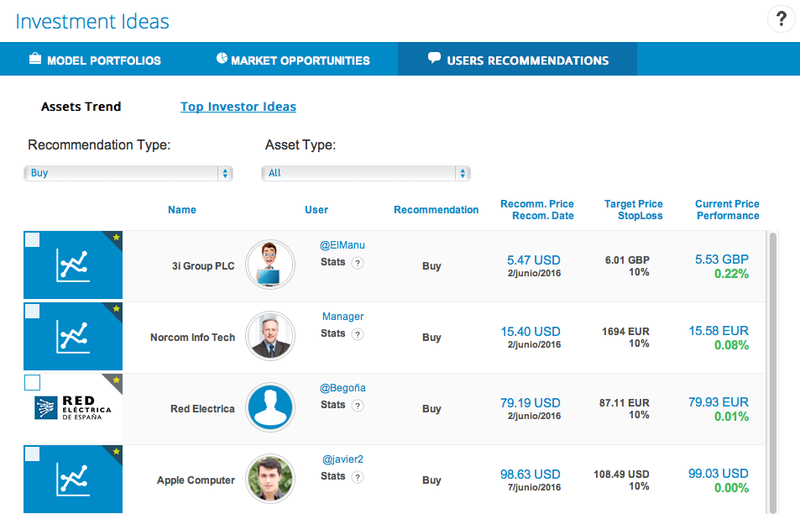 The module “Investment ideas” enlarge the contents with a tab for all recommendations made by our users. You can select buy and sell proposals and the asset category. There are two rankings: the most recommended assets and the users that recommend better. Our social features in the beginning are still there: ratings for users and portfolios, users medal and score portfolio rankings, the chance of following other users, amongst others, as we already commented in former posts. 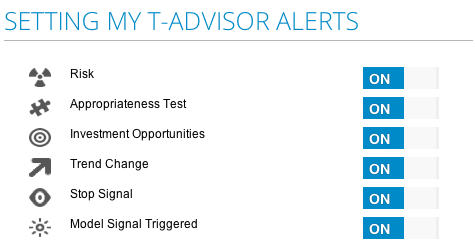 If you are already a T-Advisor user, let’s begin sharing. Recommend your favourite assets or warn about your worst selections. If you are not a user yet, we invite you to discover our community where self-directed investors are ready to share their knowledge and apply the best advance investment tools to obtain the best results. That happens only in a platform: T-Advisor! This entry was posted in Discover and tagged asset, followers, investment ideas, Portfolios, ranking, rating, recommendation, social, T-Report on June 9, 2016 by Oscar Garcia. Is my portfolio working or not? Investors organise efficiently their investments in portfolios. That’s the rule, but the question is: how to follow up my portfolio? Can I preview somehow troubles in my investments? Which ratios should I take into account to set and allocate my assets? Returns: of course, this is the first one. As investor, you do not have to be anxious about the short term, because volatility is our current rule. You should use a tool that provides you different terms in order to compare the evolution. However, you have to think about changes if the returns are negative in the middle term. Comparison with other references: it is a good idea to compare the evolution of your portfolio with the benchmarks (an index or a smart benchmark). This comparison will help you evaluate a proportion of the profits or losses that you get and diminish or underline the importance of the result. For instance, if your portfolio losses 3% and your benchmark losses 5%, it is not so bad. You are better than the index, although you should consider change your strategy, it the negative trend intensifies. Diversification: get charts about the proportion of the assets in your portfolio related to regions, currencies and asset category. A diversified allocation will help you avoid several risks. Risk: this is actually the second most important indicator after returns. 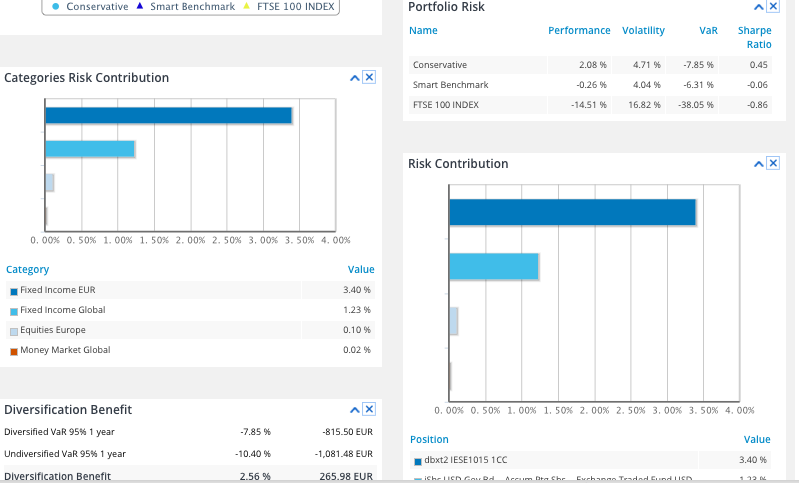 Analyse the volatility, the value at risk (VaR) and the risk contribution of your positions. A segmented analysis will focus better your next decisions. Should I keep, sell or buy? Another quite important figure is the Sharpe ratio to understand how interesting is assuming risks in order to obtain certain returns. Trend: you should as investor use tools to get the portfolio trend, if bullish or bearish. Portfolio and investor profile consistency: is your portfolio consistent with your investment profile, your risk tolerance and your expected returns? That is another question that you have to ask yourself. You need tools to make a full analysis and obtain a whole view over your portfolio and take the best decisions to improve your results. It is important that you get unbiased indicators, watch risk and returns, understand everything and take rational decisions, never guided by a short term situation. At the end, it is not only about profits, but above all capital preservation. The T-Advisor platform offers these figures so that everyone can set and allocate assets their own portfolios in the most efficient way. This entry was posted in Discover and tagged Capital preservation, Diversification, Portfolio, Returns, risk, Risk tolerance, smart benchmark, trend, VaR on May 20, 2016 by Oscar Garcia. Investing is a serious activity. It is not lottery or gambling. When you invest, you do it with a specific financial target: your retirement, your house or just obtaining good returns for your money. In any case, you cannot choose your investments hazardously, but with a strategy. The T-Advisor investment planner helps you select your target and obtain a strategy in four easy steps. 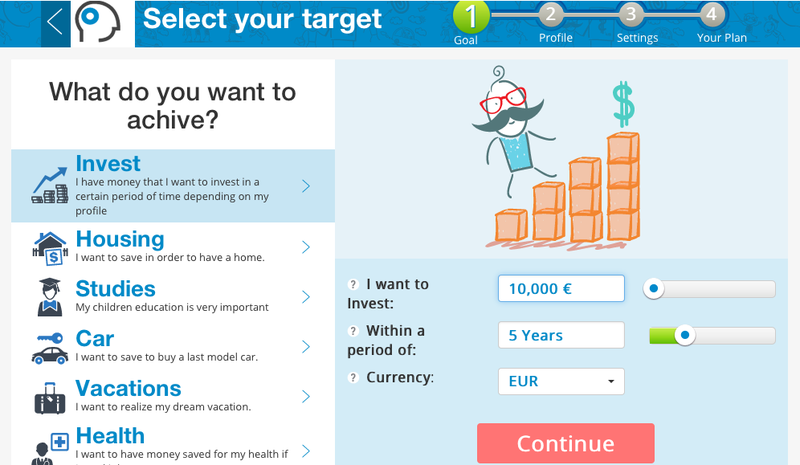 In the module “My targets”, click on “New Plan” and the pop-up will propose you up to 7 different targets: investment, housing, studies, car, vacations, health and retirement. Every plan has its own specific settings to properly adapt the results. 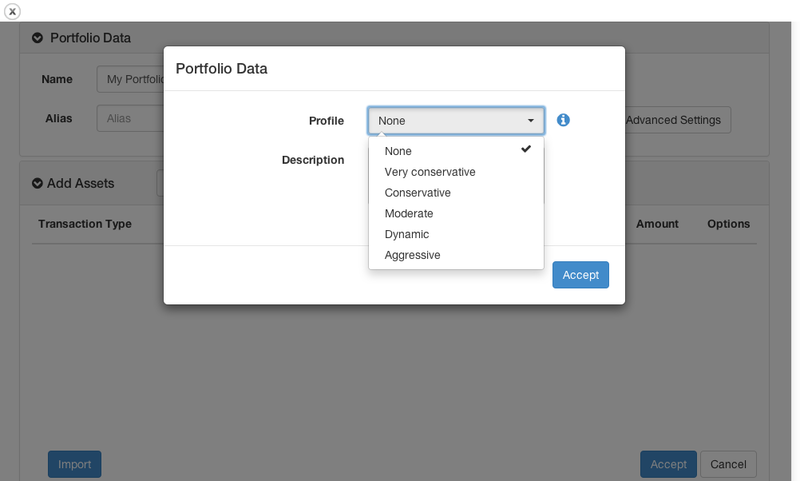 The system will ask you for your risk profile to select a comfortable strategy for you from conservative to dynamic. The risk is linked to the proportion of equities you are ready to accept in your portfolio. If you have doubts, the tool offers you an easy questionnaire to define it. 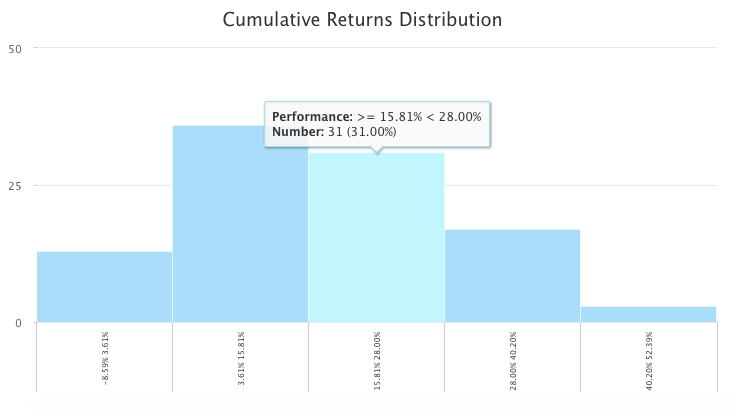 As a result, you obtain a projection with the expected returns and the best and worst scenarios. 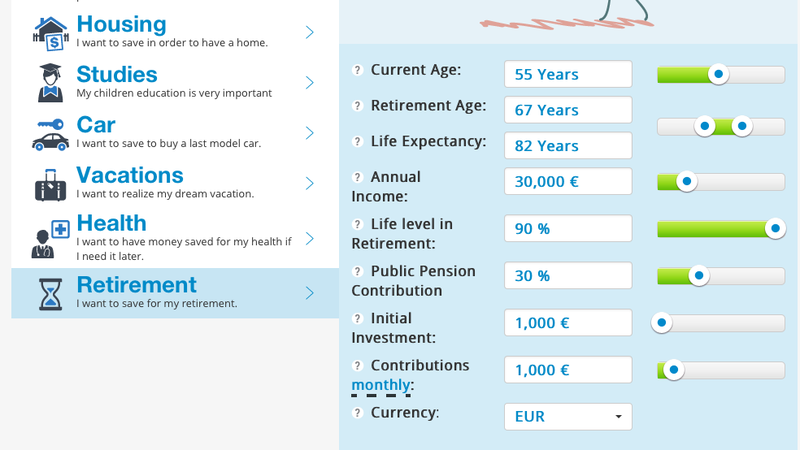 The tool also adds settings to evaluate the tax and inflation effects. At the end, the system proposes you a generic allocation linked to product categories, not with specific funds, shares or ETFs. After that, you can create your own portfolio following this proposal. Does this kind of tools make sense? Absolutely. They are very helpful for every investor, as it show the chances of obtaining concrete results for a specific period. It is a tool to avoid false projections or dreams. In investing, it is important to be realistic, as you are using your own money. Investments are always risky and past performances do not guarantee future returns, as classic disclaimers insist. That is why investors have to use tools to plan and organise their portfolios. One of the main troubles that we find in average investors is the absence of plans. They have money, but they do not know what to do with it or how to allocate it. This indecision has a negative effect: their money loses purchasing power and they do not profit from possible positive evolutions in the financial markets. They are losing in both ways. With an investment planner, people can be aware of their chances to achieve the target, organise their finance globally, perceive the progress and change the strategy, if it is not working. This is the purpose that T-Advisor supports as a model: investors have the control over their financial decisions with the best tools for free. This entry was posted in Discover and tagged Financial plan, Financial target, investment planner, Investment profile, Investment strategy on April 21, 2016 by Oscar Garcia. Markets are currently very volatile. We have lived a strong bearish period, but it is not sure that the bulls are coming, as the trend is not clear yet. In this case, panic is the worst adviser. On the contrary, investors have to analyse properly their portfolios to take right decisions. If you are not a trader, if you are a long-term investor, then you have to assume that it is difficult to avoid losses in some periods, moreover when all markets are dropping. So, your goal has to be another: capital preservation. What does capital preservation mean? Your goal as investor must be to keep your assets with the less possible losses or, of course, to obtain benefits. As there are many changes in the long term, then you have to concentrate your worries in the bearish times: how much are you losing? The success is not to lose or lose less than the reference markets, but how can you get that information? The answer is smart benchmark. 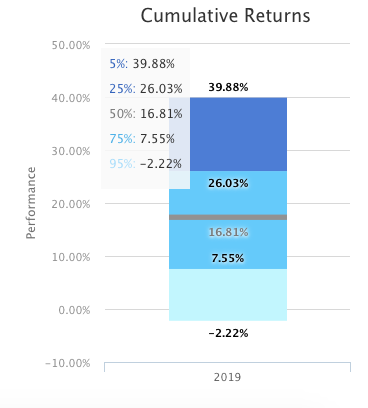 The picture above is very clear: my portfolio is losing, because I have invested in a market that is going hard into negative, but I only lose -2.4%, while the reference market (the smart benchmark) loses -14%. Not bad, huh? As we regularly say, it is important to have available the right tools to analyse your investments and take decisions. Capital preservation has to be your first goal. Don’t lose money or lose the least. Then it the bullish times, your goal has to be to outperform the reference market. 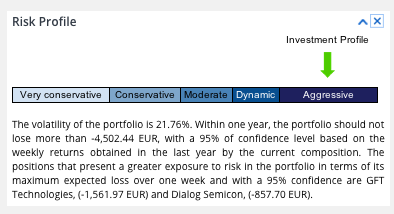 My Germany portfolio is much better than the benchmark: quite less losses in a bear period, less volatility and better Sharpe ratio. What other tools do I have to consider risks in order to preserve my capital? 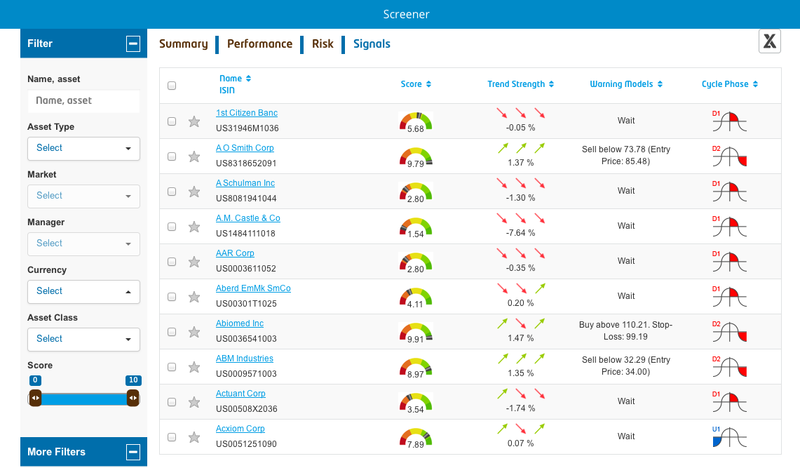 Analyse how your positions contribute to risk your portfolio. In this case, you can find out if you have an uncomfortable asset to be substituted. Look at the Value at Risk, which measures the probability of having a certain level of losses. As you can see, my portfolio has the worst VaR, what means that I have to consider some changes in my allocation to avoid future losses. All these figures will help you to understand your current position and risk. Then you can decide if you have to rebalance totally or partially your portfolio. The strategy is clear: keep your capital and set your portfolio to lose less in bad times and outperform the benchmark in growing times. 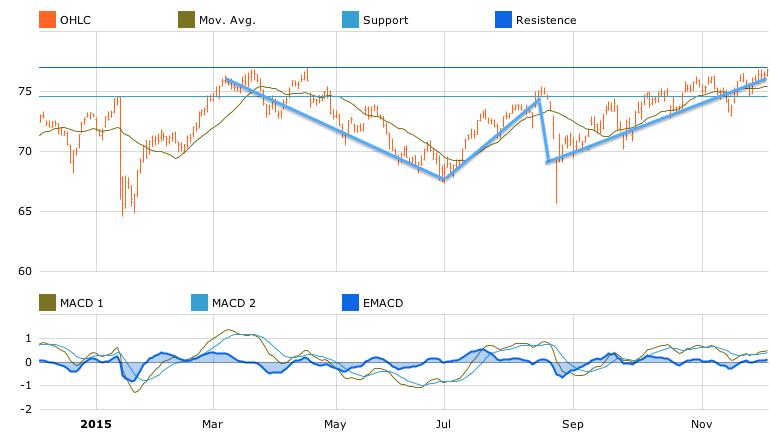 This entry was posted in Discover and tagged asset allocation, bear markets, Capital preservation, Diversification, portfolio risk, risk contribution, Sharpe ratio, smart benchmark, Value at Risk, volatility on March 4, 2016 by Oscar Garcia. Think about that you have a portfolio. Fine, you have organised your financial target into a structured composition of stocks, bonds or any asset that agrees your investor profile. However, you are a motivated investor and have interest in monitoring, improving, analysing… and you do not find the right tools to do it. What kind of tools do you need? First of all, you need a platform that lets you easily create your portfolio with simple steps and implement your assets from your own Excel file or directly on the system. It is important that you can select properly your profile since the very beginning. Once you have created your portfolio and included the assets, you need to monitor and analyse it. It is not only about different timeframes for performance or volatility, but also an analysis of the diversification and the risks. As investor, you should take into account that one of the main goals is capital preservation. This means that a right investment strategy should outperform the benchmark in bull periods and have substantially less losses in bear periods. 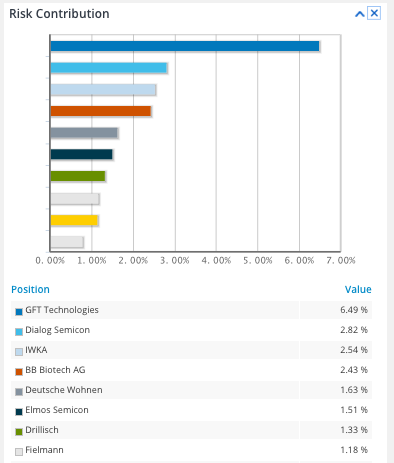 Diversification benefit, which assets contribute more to risk or a comparison with the composite benchmark (or smart benchmark, as it is denominated in T-Advisor) are useful tools for it. This analysis should also include a graphical analysis of the allocation to understand the risk concentration in different concepts. And finally, what refers to analysis and monitoring, you should have access to a kind of scoring to perceive the quality of your portfolio and some suggestions to improve it. In the case of you perceive that your portfolio needs an improvement, your platform should include a tool to analyse where the troubles come from and optimise the results. The optimisation has to propose an efficient frontier for the portfolio allocation and a proposal of what changes you should implement. And, last but not least, you need an alert system to react when there are deep movements in the markets that affect your portfolio. Your platform should also provide you a system to set the alerts depending your own needs. 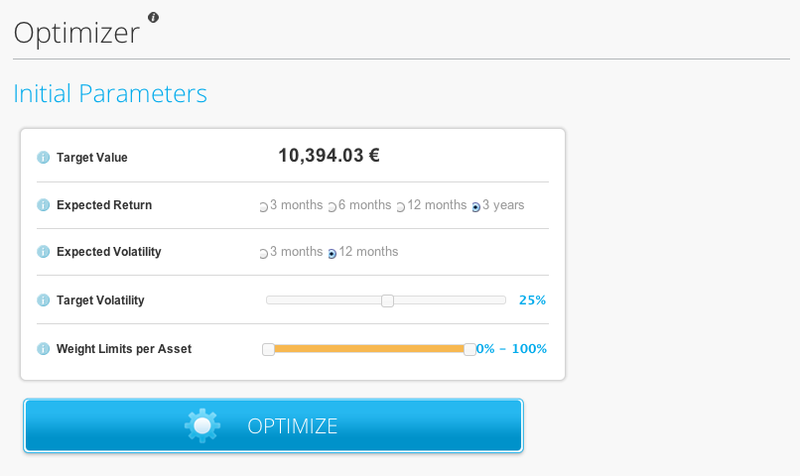 T-Advisor is your alternative to create, monitor, optimise and modify efficiently your portfolio in a self-directed way. There are many platforms, but they usually have less tools or under payment. You can choose T-Advisor for free to feel the investment experience and control your finances on your own. This entry was posted in Discover and tagged alerts, asset allocation, Capital preservation, Efficient frontier, Investment monitoring, Investment platform, Investors, Optimiser, Portfolios, Risk analysis, scoring, Tools on February 18, 2016 by Oscar Garcia. 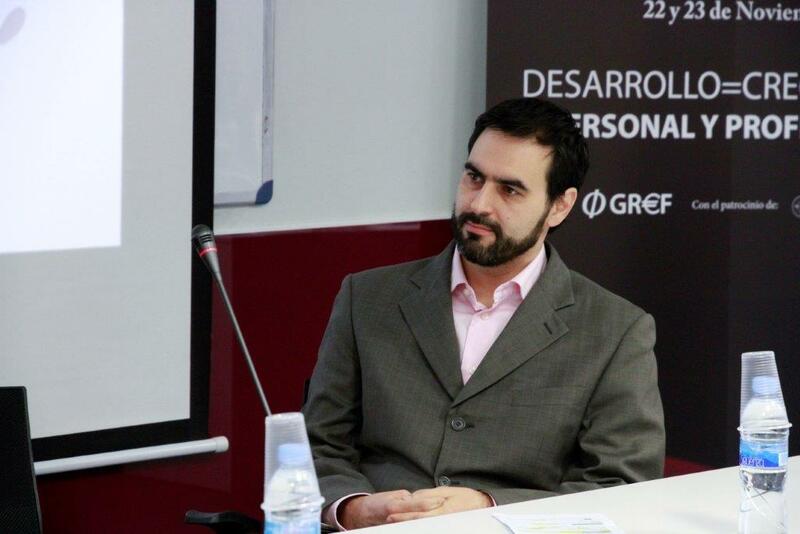 Ph.D. David Pla-Santamaría is the director of the “Master in Financial Advice and Insurances” in the Universidad Politécnica de Valencia. In its last edition, this master implemented T-Advisor as a learning tool for the students. Pla-Santamaría underlines the quality and professionalism of T-Advisor and how it approaches the students into the real work as a financial adviser. What is the origin of the master? How many editions have been taking place? Tell us about the history and relevance for the future advisers. The master comes from a shorter course organised by the Universidad Politécnica de Valencia for the managers of Fidenzis in 2007. The group was so satisfied with the course that they intercede with Bancaja to organise for this bank a 200-hour-course. The own professionals designed the programme for the course based on the daily needs detected by them. We have organised 9 editions of the master and 24 from the European Financial Advice Diploma. The relevance of these courses for future advisers is clear: the programme includes and exceeds what EFPA (European Financial Planning Association) asks for the EFA (European Financial Advisor) level. EFPA is a main player in the regulation of the financial advice as a profession in Spain and Europe. A good trainee validated by them is key to grow professionally in this branch. How do you know about T-Advisor? Why did you decide to implement to your master? What did T-Advisor provide? We knew the brand and the relevance of TechRules as a provider of information management for the financial sector for years. We also knew that it was a main player in Spain. We have clear since the beginning that the implementation of T-Advisor to allow our students “learn-doing” and apply all the knowledge from our course was a strategic decision. We used other tools in the former editions, but we needed a more professional one and with more quality. That is why we chose T-Advisor. What positive aspect do you underline from T-Advisor for your students? T-Advisor opens the door to a wide universe of assets to work with and to design personal solutions to specific problems or needs for real customers. 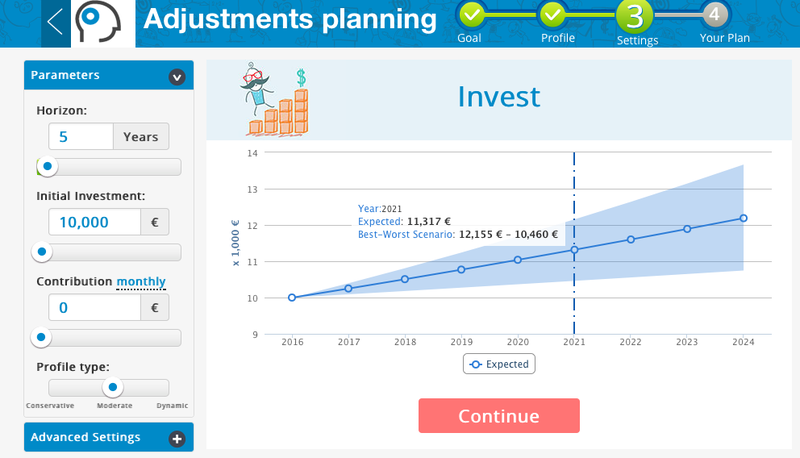 Moreover, it focuses in a quantitative way the students in the decision-making and allows them to optimise portfolios, analyse their decisions, quantify their mistakes and good choices and, really, feel like a real financial adviser with a professional asset management platform at their disposal. What would you propose to T-Advisor so that students had even a better experience to the real work as adviser with the platform? Add a wider universe of assets, above all, ETF and investment funds. Include non-quantitative information for some assets, as the RF index. More intuitive operations and graphic representation of the portfolios. Include some orientations about the tax effects of the financial decisions. How do you evaluate the T-Advisor proposal to be used in university courses as a tool? It is very interesting in all levels. The possibilities of T-Advisor to round out and strengthen the learning in the classroom are key for a better training of the future professionals of the financial branch. Although the student use later the own platform of the entity where he works, he always will be able to continue making independent analysis with T-Advisor. This will allow the student to improve the quality of his advice for his customers. T-Advisor is a good tool to reduce the adviser conflict of interests between the customer and the entity. When are you going to open the next edition of the master? The editions of the Master in Financial Advice and Insurance in the Universidad Politécnica de Valencia are from October to December of the following year (15 months). That is why the next application period will be open in July 2016. However, we are aware that there are many people interested in getting a specialisation in financial advice that cannot wait till those dates. That is why we have an alternative course called “Financial Adviser Course” that covers the whole EFA level of EFPA. The application is open the whole year. The main difference with the Master is related to the teaching methodology and student monitoring. This entry was posted in Discover and tagged David Pla, EFA, EFPA, Financial advisers, Master in Financial Advice, Techrules, Universidad Politécnica de Valencia on January 21, 2016 by Oscar Garcia. What market opportunities do we post and why? 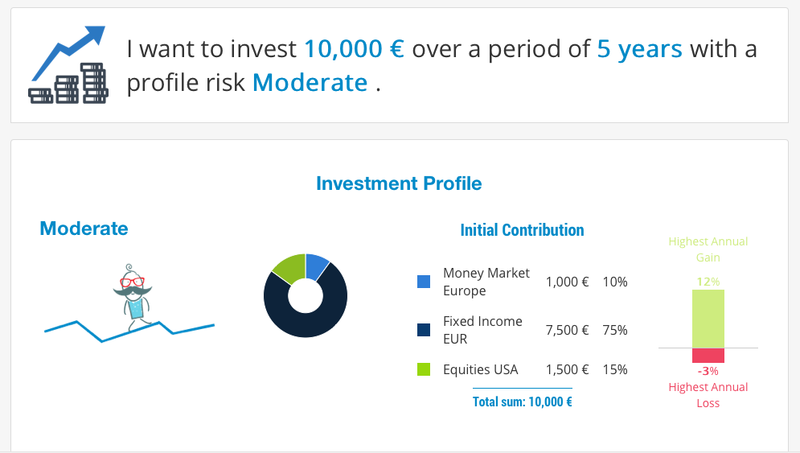 T-Advisor, your suite for self-directed investment management, has a module to help investors find new ideas to improve their returns. These “Investment ideas” has a list of market opportunities from exchanges around the world that our algorithm selects and update every Monday. That is why we post every week a selection of them, but what criteria do we use to choose you some of them? First of all, we look into all the markets to find what stocks have been selected. The screen shows initially just some figures from the securities of each market. We take into account the trend. We opt for the ones with bullish trend and with less than 1% slope. Why? Because we prefer stable and progressive increases instead of sudden ones which makes the security more volatile. The performance: it has to be positive in the year and show also a positive figure in the last year, to confirm that the stock did not suffer a strong variability. We consider that investments should be for a long-term. Trading is also a possibility for investors. We are not critical with it, but we prefer a more stable model. That is why our weekly proposals tend to be bets for that idea. Of course, markets change daily, but it does not mean that investors have to react immediately to every event. Portfolios should tend to be stable and include changes when your goals and risk profile change, because you evolve also as investors, or when your securities do not play a positive role anymore. That is why it is relevant the long-term view. That avoids sudden changes… and mistakes guided for the moment. 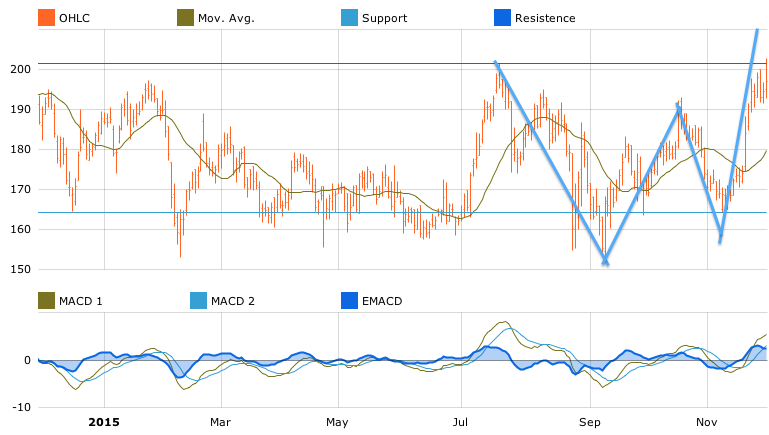 This entry was posted in Discover and tagged Chart, Figures, investment ideas, liquidity, Performance, Score on December 4, 2015 by Oscar Garcia.